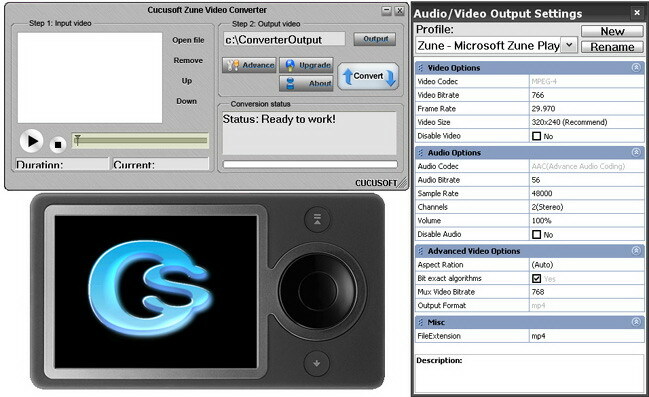 How to transfer DVD/Video/Youtube video to Zune ? 4. Support "Drag and Drop"
6. Support various Zune video formats including Windows Media Video (.wmv): Main Profile, CBR or VBR, up to 1.5 Mbps peak video bitrate, 320 x 240 pixels, 30 frames per sec., with Windows Media Audio up to 192 Kbps, 44.1 kHz, stereo audio; Simple Profile, CBR, up to 736 Kbps video bitrate, 320 x 240 pixels, 30 frames per sec., with Windows Media Audio up to 192 Kbps, 44.1 kHz, stereo audio.